← Penn State’s Berkey Creamery gets high honors! These delectable little cookie-cakes are on my 2013 baking list, so since we are 3 1/2 months into the year, I figured I better start baking. I researched recipes on the internet, and the one that seemed the easiest and highly rated was from allrecipes.com. The ingredients are basic and the process is really easy. ( although I do need to practice my folding technique.) The flavor is a light lemon and the texture is like a sponge cake with a moist crumb. You should use a Madeleine pan. I bought mine for $12. Be sure to butter and flour the pan. 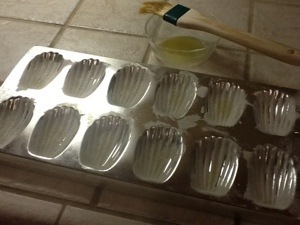 I’m sure that baking spray would work, but I prefer to do it the way traditional bakers do it. 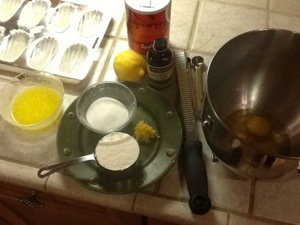 I used my Kitchen Aid mixer to mix the egg/sugar mix, and mixed it for 7 minutes on high. Next time I won’t fill the pans too full, and I’ll watch the baking time and pull them out of the oven right when the edges brown. I think 13 minutes will be perfect. All in all, I’m happy with the first try. 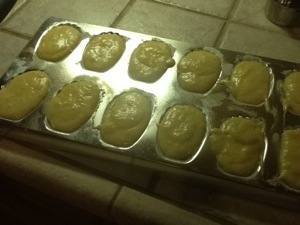 Other recipes I will try are Ina Garten’s coconut madeleines, and Smitten Kitchen’s. Butter the pan using melted butter and a pastry brush. Then shake flour in each well. Whip the sugar/egg mix until thick. Posted in baking, references, recipes and tagged dessert, food, traditional bakers. Bookmark the permalink. Oooo, Claudia, they are lovely. I can smell them baking…. Actually, I really wish I could. I could use a good cookie! I love how detailed you get with all your great pics and written instructions! It is really helpful. Can you leave the Lemon Zest out if you just want the taste of vanilla? Absolutely you can leave out the lemon zest. 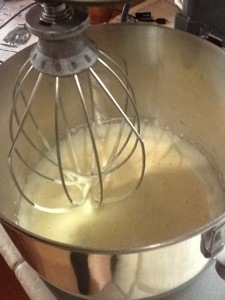 Increase the vanilla to 1 tsp, or double the amount for a full vanilla cookie. Great job at your first go – they look great! Thanks, and your Bailey’s brownies look amazing! 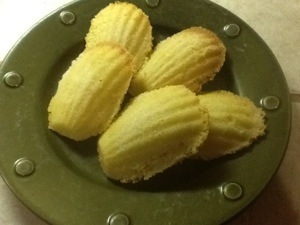 I’ve always wanted to try madeleines! You should try them, you’ll be pleased with how easy they are. Let me know if you make some.